One of my favourite bloggers and friend, Monika from The Splendid Willow, has asked me to share my "2 cents" on what design trend I am digging lately! As for the decor department around here, it is a bit stagnant. Oh.. big news around here - I hung a chandelier in my oldest daughter's room last week, all by myself! Need to take photos so you can all admire my amazing "light hanging" skills! You are so awesome. My husband put up our chandelier and I was taking notes on how to do it next time. Can't wait to see pictures. Great feature at Splendid Willow, Barbara. I love gallery walls, and posted a story on some of my favorites last month. Please take a photo of the chandelier you hung yourself! Impressive! You rock girl!! I'm super impressed with your abilities. I want to see, I want to see! I want to see pictures!!! I'm sure it is gorgeous! You are such a rock star! Who says it can't be done? 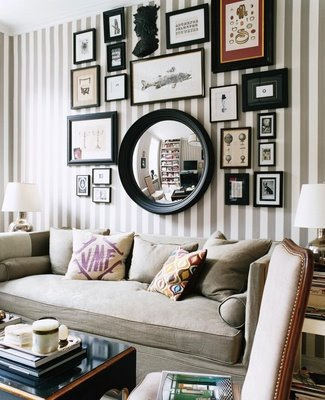 Loved the image you shared over at The Splendid Willow - what a great gallery wall! Barbara, thank you so much for participating. I loved having you and I know I can always trust you to bringing something lovely to the table. You are the best! Packing like crazy over here. One week in sunny California. Off with the boots and on with the flip flops. Wihooo!